Well, the forecast for Saturday didn't look promising: "MOSTLY CLOUDY. A CHANCE OF SHOWERS THIS AFTERNOON. SNOW LEVEL 7500 FEET." But a quick look out the window in the morning showed lots of beautiful sunshine, and a quick glance at a bunch of mountain webcams confirmed that it was mostly sunny up there too. Time to head out for a quick afternoon ski run. Got a very late start, and left the parking lot at 12:20pm, but still made it to Muir by 2:40pm. Mostly sunny around the Mountain, but with just enough puffy clouds in front of the sun to keep it shady for more than half of the ascent. Otherwise, it would have been an oven since there was no wind. A ring of clouds clung to the Mountain around 11-12000 ft for most of the afternoon, but nothing looked very threatening. 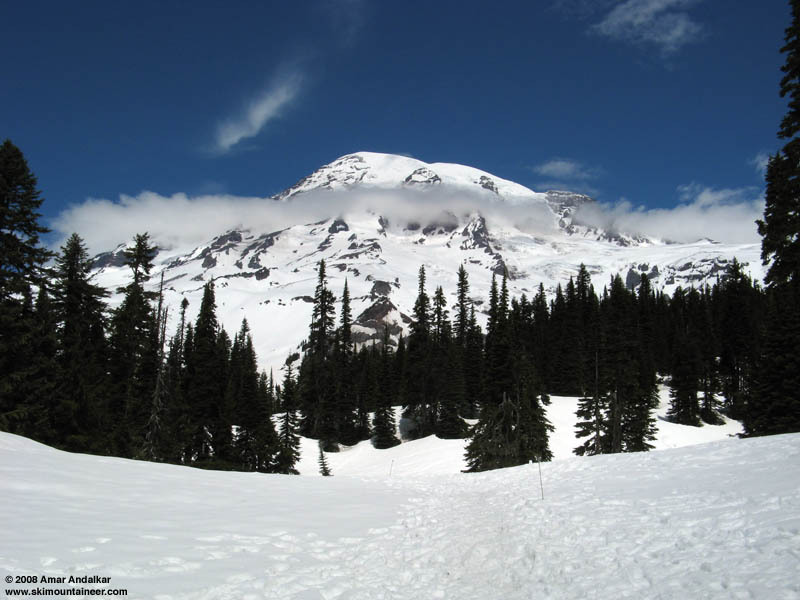 Surprisingly, although there were well over a hundred climbers and hikers out on the Snowfield, there were hardly any skiers, less than 10 and maybe a similar number of snowboarders. The 10+" of new snow which fell at Paradise from Tuesday night through Wednesday has consolidated a lot, but not quite enough yet. It was nice for skinning, grippy with ski penetration of only about 1" most of the way, but somewhat sticky for skiing below 9000 ft. Needs a couple more days of strong sunshine to really corn up. Above 9K, it was already very nice with large areas of corn, and surprisingly a lot of the surface was firnspiegel, one of my favorite snow conditions. The snow is still continuous for skiing across the top of Panorama Point and through the Pebble Creek rolls, but it's melting fast and some routefinding will soon be required to remain on continuous snow. Despite the new snow, it was surprising that the upper mountain looks somewhat dirty and not all shiny white. 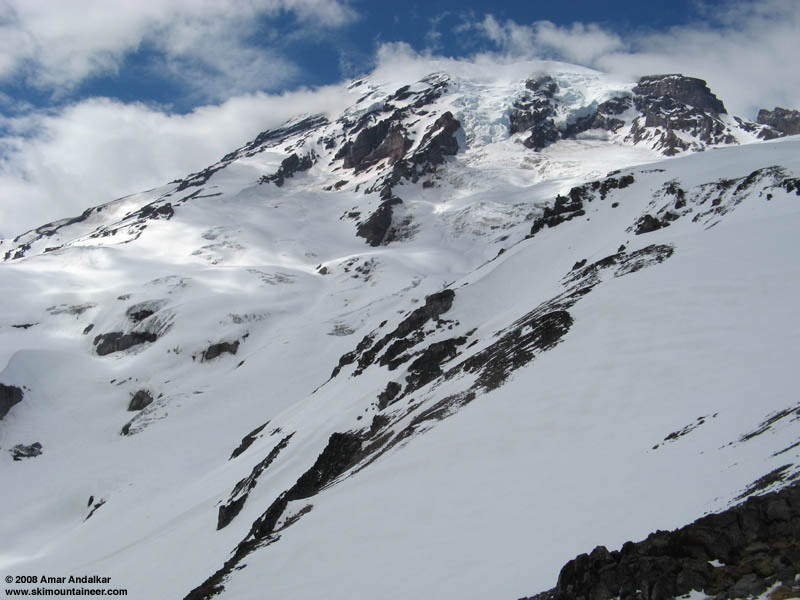 There's lots of avy debris from last weekend on Nisqually Icefall and Ice Cliff, rockfall debris on Wilson Glacier near the base of the Thumb, etc. 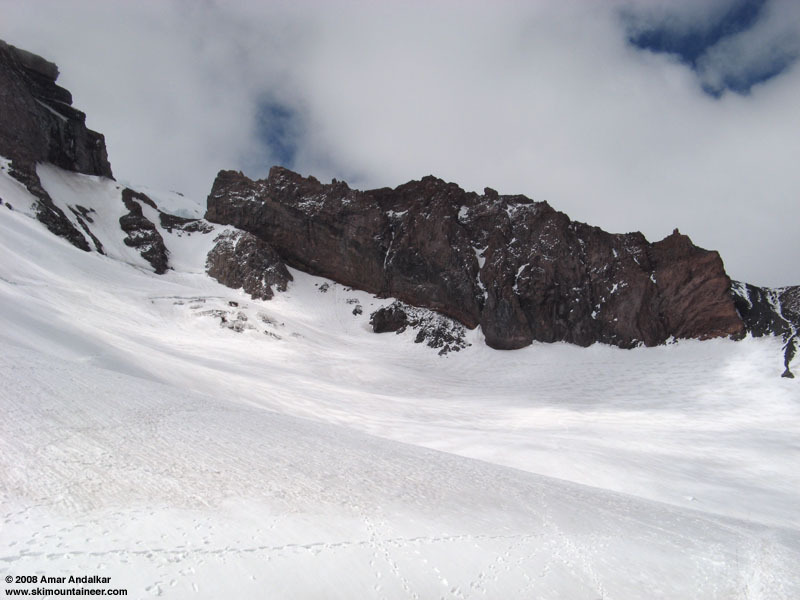 And the main ski routes to the summit from Muir are already becoming discontinuous: Cathedral Gap is almost completely bare, and Cadaver Gap nearly so, with a major bergschrund issue at the bottom. The upper Cowlitz Glacier from Camp Muir, with Cadaver Gap (left) and Cathedral Gap (right). The clouds were thickening a bit by the time I skied down at 3pm, and showers were visible in the distance, but none too close to the Mountain. Eventually did hit several miles of rain showers on the drive back just outside the park entrance, but it remained mostly sunny even during the rain. By the way, the recent new snow brought the seasonal snowfall total at Paradise up to 908" according to the Park's phone recording, which is the first time breaking the 900" mark since there was 1033" in 1998-99. It's also only the third season over 900" since 1974 (including 938" in 1996-97), and the 7th highest total ever since record-keeping began in 1916 (although records are incomplete or missing for about 10 different seasons). I remember predicting an expected snowfall total of around 900" for Paradise, back in November at the Northwest Snow and Avalanche Summit when several people asked me about La Nina's expected effects, and it's nice to see that a very simple statistical analysis has some predictive value. As a caveat, however, this year's snowfall total may not be very accurate, since there was a major interruption in recording the daily snowfall amounts in early February, when heavy snowfall closed the road to Paradise for about 10 days (see http://mountrainierclimbing.blogspot.com/2008_02_01_archive.html). I like that 1st pic.� Looks as bluebird as yesterday's weather in the Olympics. The sunset coming back on the ferry over a cloudless OlyMtnRange was hard to beat. I saw rainier from the summit of old snowy. It looked good, but quickly clouded over later in the day. It was interesting to see clouds coming from the west and the east at the same time. Too bad the westerly ones held rain! I was there with two others, starting up at 11 AM, going up to 8500' The other two dropped into the Nisqaully chutes for a run down and skin up to Pan Pt� on softening snow with some sluffs and snowballs, but OK. I stayed above for a nice ski down and some lapping back up. Snow was nice smooth with 1 to 3 inch deep tracks until the bottom of Pat Pt then an bit slow and grabby as it baked in the afternoon. It was a beautiful day on the mountain. We felt and looked a bit baked, too, expecting clouds and finding bright sun and no wind. A stop for good burgers at the RMI compound in Ashford fixed us up.